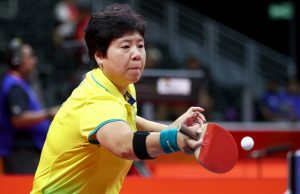 Australia has defeated Wales 3-1 to move in to the semi-final of the Women’s Team Event at the 2018 Gold Coast Commonwealth Games. Despite the win it was Wales that drew first blood when Jian Fang Lay faced Charollote Carey. The pair had played four years ago in the main draw of the teams at the Glasgow Commonwealth Games. Lay had come out on top that time 3-0. Jian saved a match point at 11-10 down in the fourth game. And again at 12-11, and 13-12. But a fourth match point was just one too many. Carey took the game 15-13 to put Wales on the board. Australia were immediately back on course however with a straightforward 3-0 win from Melissa Tapper over Chloe Thomas. Miao Miao and Jian Fang Lay then showed why they are Commonwealth Games doubles medalists. The duo quickly dealt with Anna Hursey and Chloe Thomas. In the third singles matchup, Charlotte Carey continued to be a thorn in Australia’s side. The Welsh lefty came out swinging and took the first game off Miao Miao 11-5. The Aussie veteran fought straight back with a 11-4 win. The next game was an impressive display of courage and resilience by the Aussie. Down 10-2, Miao somehow made a miraculous escape and won the game 13-11. But Carey just wouldn’t go away, taking the fourth game to send it in to a decider. Miao had the upper hand early, running away to a 5-1 lead. There was no turning back, and Miao took the game 11-3 to win the match for Australia. The Aussie veteran says it’s the crowd that got her and the team over the line. Australia will now face Singapore in the semi-final.